In this tutorial, we will be making a lightweight blog system with PHP and CSS3. The blog posts will be stored in a folder as files (in the markdown format). The system will not use a database and will not have an admin panel, which makes it perfect for small blogs with only one author. It will have an RSS feed and a JSON read-only API, and will feature a completely responsive design that adapts to the screen size of the device. In this first part, we are going to write the PHP backend, and in part 2, we will code the HTML and CSS. Let's begin! Body of the blog post. This will make the first line a H1 heading. If this is the first time you've seen markdown, the next section is for you. Markdown is a lightweight format for writing text. It has a minimal and intuitive syntax, which is transformed into HTML. This makes it perfect for our simple blog system, as it won't have an admin panel nor database - all the posts will be stored in a folder as files. We can't simply display the raw markdown directly, first we have to transform it into HTML. There are a number of libraries that can do this (in every major language), but for this tutorial I chose the PHP Markdown library, as it integrates nicely with composer. RSS Writer, which will output the RSS feed for the blog. You could simply download these libraries and use them straight away, but let's see how we can do the same with composer (note that you need to follow these steps only if you are starting from scratch; the zip accompanying the tutorial already includes all the necessary files). You can obtain the specific identifiers for the libraries and their versions from the composer package repository, or by following the instructions that each library included on its github repo. This will let you create instances of the libraries without having to include their PHP files individually. I am using one additional PHP library - Dispatch. This is a tiny routing framework that I've mentioned before. It will let us listen for requests on specific URLs and render views. Unfortunately it doesn't have Composer support at the moment, so we have to download it separately and include it into the project. blog.title = "Tutorialzine Demo Blog"
blog.description = "This is a lightweight and responsive blogging system.."
blog.authorbio = "Created by ..."
; Framework config. No need to edit. These settings are used throughout the views, so when you are setting up a new blog you won't need to edit anything else. // the markdown parser and RSS feed builder. // The front page of the blog. The get() function of Dispatch creates a pattern that is matched against the currently visited URL. If they match, the callback function is executed and no more patterns are matched. The last get() call sets up a pattern that matches every URL in which case we show a 404 error. generate_json() is only a wrapper around json_encode, but I included it for consistency with the generate_rss function. // Return an array of posts. At the top of the file, we have a number of use statements, which import the necessary namespaces (read more about PHP's namespaces). If a file or folder does not exist, the request will be redirected to index.php. Continue with the second part, where we are creating the views and the responsive CSS design. Great flat-file tutorial, Martin. 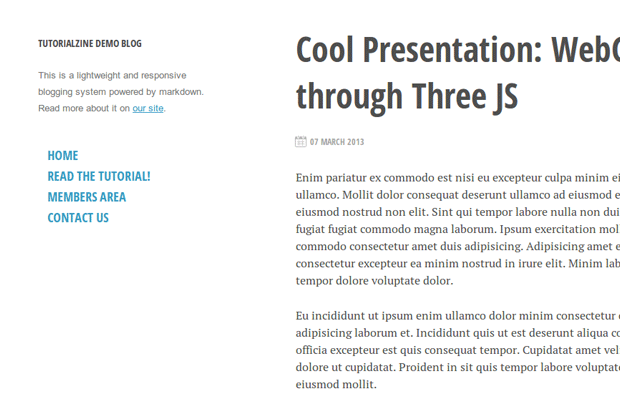 Markdown is great for simple blogs just like this tutorial's. I didn't know Dispatch, looks cool. Cool! I am bookmarking this. may i translate this tutorial to Persian language and publish it in my own website width back link of your website ? Thank you! No, unfortunately the tutorials can't be translated. See here. great write Martin. I'd been read your latest article about small php framework and thought to write my own too, but you came first. Nice job! im not understand this not work with me ? why im getin this > (THIS PAGE DOESN'T EXIST! Make sure that you supply a correct site.url in config.ini. The other possibility is that you don't have any posts. Good stuff here! Out of curiosity, why didn't you start with Kirby as the backend rather than creating your own? Just as a tutorial? That wouldn't be very lightweight, still worth checking. Besides working with composer it's pretty comfy as is. I enjoyed seeing, being of congratulations, very good tutorial, be very successful! It also wold be nice with an infinite-scroll at the posts, hope you teach how to add it next week. The requested URL /blog/2013/03/image-picker-jquery-plugin was not found on this server. I'm using php version 5.3 now, and I can display the index page , but whan I click the title of a post, I get the error above. Please kindly help me fix it. I just found this after looking for a very simple blog platform (I have no major use for WordPress on my personal blog anymore), can I use this freely on my website (with credit)? Also, is there an easy way to display all posts in a list on the sidebar? I'm sure with a bit of tweaking I could get it working, but just checking if there would be a simpler way. What part of the code displays the calendar icon next to the post date? it keeps disappearing when I modify the code to my liking. Why don't you simply work with XML files and the according PHP functions? No need to explode text here and there. I wouldn't find it simpler, but you are free to change the code and do it however you would like. Could you tell me how this comes? You are probably running an old version of PHP that doesn't support anonymous functions. You need PHP 5.3 or later. Very good Tutorial!! Can you make a similar tutorials on slim PHP micro framework. How do I create a new post and how will it appear on the top of the site? I wrote the blog then what do I save the file in? What should I rename? Which extension? This part is really making me sick. Hi, great tut, I uploaded it to my development Web Server but ran across a problem, whenever I try to access a post, I get 404. When I click a blog post from the homepage it gives me an error saying "No input file specified"
Anyway, thanks for this awesome tutorial. I had this same problem, is the server you're running it on use SuPHP? If so, that's the problem. You need to set the permissions correctly for all the files/directories. I want to create a search engine like whenever they search something from the site that relates a blog it should show the result. Like when they want to search something that is on my blog. It should show it. How do I do it? Something more than Google custom search (google.com/cse)? Hi, does anyone know how to auto index the posts only on page one (newest posts) ? This would be a big help? How would I go about moving the blog system so that it shows up and runs based on 'blog.php' rather than 'index.php'? In other words, how do I get a cover/home page to show up instead of the blog? Love the concept of a simple non-admin blog system. Great work! I really like this format, but for the life of me none of the solutions have addressed the single post issue. I even uploaded the download example to a test folder only modifying the .ini file, and the results are that the single posts still errors out. If tried all the .htaccess modifications mentioned so far with no love. Any ideas on where else the issue might be? I am having the single post issue as well. Anyone have ideas where I should look in the code? First of all, thanks for the Tutorial and the great minimal Blog System! I have a 4-language website and would like to customize the Blog System so that when a user changes the language, then the respective .md files from a to be included under the folder. I would be for any hint or solution proposal grateful! ... and please excuse the language skills (With greetings from Google Translator). Thanks for the tutorial. Very simple to understand.